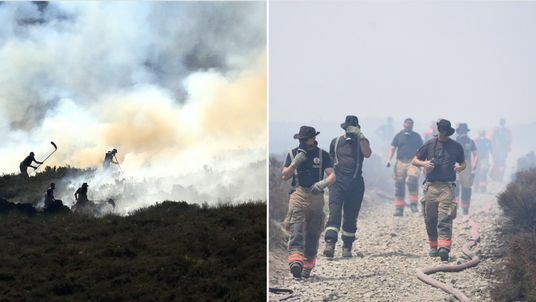 The military has been called in to help battle a huge moorlands fire which has been raging for three days. The blaze covers 3.7miles (6km) of moorland above Stalybridge and prompted the evacuation of up to 100 homes. Greater Manchester Fire and Rescue Service (GMFRS) confirmed it had asked for military assistance. Four schools have closed and a GP said he had seen patients with nosebleeds, coughs and eye problems caused by the smoke. Firefighters are having to haul pumps and hoses for up to two miles in blistering heat to reach parts of the fire. Prime Minister Theresa May said the government is keeping the situation "under constant review".